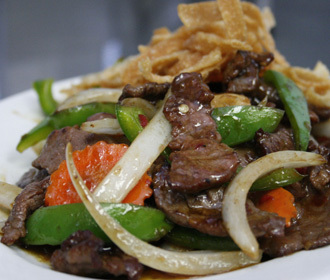 "Best mongolian Beef in Las Vegas " One of Kung Fu Plaza's most sought after dish, cooked in what we coined as "The Mongolian Bond" A Special combination of cooking methods, along with our rich homemade thick Mongolian sauce which includes rich red Chili paste, fresh grounded garlic, in addition we use fresh onions, green bell peppers, slices of fresh carrots, all stir-fried on a blazing hot, Extra large stationary Wok reaching upwards of 500°F bonding the cooking wine, tender slices of Certified Angus Beef, with all the ingredients, which is carefully reduced, and finally served sprinkled with Crispy Egg Noodles. Served with a small cup of gourmet Steamed premium Jasmine Rice. The Mongolian Bond specially cooked with our rich homemade Mongolian sauce along with a rich red Chili paste, fresh garlic, onions, bell peppers, all stir-fried and carefully reduced, and finally sprinkled with Crispy Noodles.